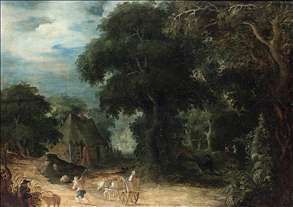 Flemish painter. He was the son of Elisabeth Yselstein and Willem Govaerts, a dealer in second-hand clothes and paintings. He was admitted as a master to the Antwerp Guild of St Luke in 1607-08. In 1609 he bought two houses on the St Jansstraat next to his parents home. On 9 February 1622 he married Isabella Gillis; they had two daughters. He trained a number of painters: Hans Groenrijs (1617), Andries van den Bogaerde (1619-20), Niclaes Aertsen, Gysbrecht van den Berch and Frans Snyders (the last three from 1623 to 1624). 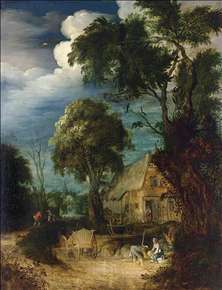 He collaborated with Frans Francken II. 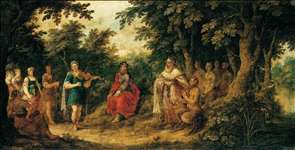 See more details about "The Judgement of Midas"
See more details about "Wooded Landscape"